We’d love your help. Let us know what’s wrong with this preview of Thank You, Omu! by Oge Mora. To ask other readers questions about Thank You, Omu!, please sign up. Be the first to ask a question about Thank You, Omu! Omu means "queen," in Igbo, which is the tradition from which Mora writes. It has the shape of a folk tale, somewhat like Stone Soup in that food makes community. Omu is a grandmother who makes a rich Igbo stew and everyone that passes by and smells it cooking and nocks on her door gets a helping. . . until it is gone, alas. Though they all come back in the end to share their food with her, too. It's a about gratitude, helping others, sharing. Great collage art, colorful. I read this because Aman Omu means "queen," in Igbo, which is the tradition from which Mora writes. It has the shape of a folk tale, somewhat like Stone Soup in that food makes community. Omu is a grandmother who makes a rich Igbo stew and everyone that passes by and smells it cooking and nocks on her door gets a helping. . . until it is gone, alas. Though they all come back in the end to share their food with her, too. It's a about gratitude, helping others, sharing. Although the accompanying illustrations of Oge Mora's Thank You, Omu! would generally and aesthetically speaking be just a bit too cartoon-like for them to be considered absolute personal favourites, I have indeed been more than pleasantly surprised at how much I have visually enjoyed them and how the pictures both colour scheme and general descriptiveness wise do indeed work very well with the author/illustrator's presented verbal narrative, how glowingly both text and images mirror and reflect Although the accompanying illustrations of Oge Mora's Thank You, Omu! would generally and aesthetically speaking be just a bit too cartoon-like for them to be considered absolute personal favourites, I have indeed been more than pleasantly surprised at how much I have visually enjoyed them and how the pictures both colour scheme and general descriptiveness wise do indeed work very well with the author/illustrator's presented verbal narrative, how glowingly both text and images mirror and reflect the importance of being good neighbours and sharing, of giving freely and without second thought (and even if one literally gives away everything, like how Omu gives away all of her stew, all of her supper fare, that in a thriving and vibrant, that in a caring and community oriented neighbourhood, good deeds will fortunately not like that silly saying states end up resulting in personal punishment but will instead mostly if not always have positive effects and help cement and strengthen neighbourhood ties). Manybooks QNPoohBear wrote: "It's not only checked out at the library but sold out at the high end toy store in the neighborhood! The author used to work there QNPoohBear wrote: "It's not only checked out at the library but sold out at the high end toy store in the neighborhood! The author used to work there and still lives locally. I'll have to hunt this one down at the li..."
This exuberant debut is sure to be a favorite read aloud. It's sort of a reverse Stone Soup in that Omu gives and gives and gives until she has no dinner for herself. The crisp collages help propel the story of a generous soul. During this past summer, I had the pleasure of listening to Oge Mora read the book and discuss her art. She was such a delight, and so is this story. It's a beautiful book and her lovingly made collages give much depth to her sweet characters. Omu cooks her delicious red stew all day in this delightful debut picture-book from author/illustrator Oge Mora, generously offering a portion to everyone who follows their nose and knocks on her door. When she finally reaches her own dinnertime however, she discovers that there is nothing left in her big pot. What will she do? Fortunately, her generosity finds its response in the people with whom she has shared, people who want to say: "Thank You, Omu!" 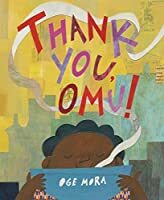 Omu, which apparently means "queen" in Igb Omu cooks her delicious red stew all day in this delightful debut picture-book from author/illustrator Oge Mora, generously offering a portion to everyone who follows their nose and knocks on her door. When she finally reaches her own dinnertime however, she discovers that there is nothing left in her big pot. What will she do? Fortunately, her generosity finds its response in the people with whom she has shared, people who want to say: "Thank You, Omu!" I LOVE these illustrations, and the story is so warm and loving. Beautiful, kind and original. One of the nicest picture books of 2018. The thick red stew that Omu is making will surely be the best dinner that she has ever eaten. It smells wonderful and the taste test promises great things. However, when she sits down to read while she waits, the scent of he Thanksgiving may now be past in the United States, but there’s no end date on sharing, giving thanks, and giving back. 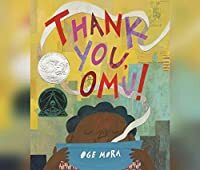 Author-illustrator Oge Mora’s debut picture book Thank You, Omu! is a gorgeous soon-to-be classic. It is perfect for year-round reading, and holiday gifting. In all, Thank You, Omu! is an artful, food- and community-themed picture book with a diverse cast of characters and gorgeous and vibrant cut paper art. It belongs in every picture book collection. Using acrylic paint, china markers, pastels, patterned paper, and old-book clippings, the author has created collage illustrations that will entertain readers young and old alike. The narrative describes how the kindness and generosity of one venerated member of the community comes back to her in kind. I love how the neighbors are nameless, yet encompass a wide range of professions and backgrounds. Overall, it's a fast read and shows how sharing our blessings with others can come right back to u Using acrylic paint, china markers, pastels, patterned paper, and old-book clippings, the author has created collage illustrations that will entertain readers young and old alike. Overall, it's a fast read and shows how sharing our blessings with others can come right back to us. Barbara I totally agree. The book made me want to taste her stew too. Manybooks Yes, I wanted that recipe included! I fell in love with this debut author's picture book about generosity and community. Told with a lovely folk tale rhythm, this has the feel of a classic tale and will make a perfect read aloud. The collage illustrations are absolutely terrific and a joy to experience along with the story. Done in warm mellow tones with many fascinating perspectives, they really match the feel of the story. A beautifully illustrated tale of sharing and nurturing community. Nice collages, and really sweet story. Omu, queen in Igbo, feeds her neighborhood and in return is fed. Very sweet, beautiful collaged illustrations. This book got a Caldecott Honor this year (debut author/illustrator!) and is just as good as everyone says. Food, generosity, diverse characters, community helpers, and a sort of Stone Soup twist at the end make for an all-around winner. "The collages for this book were created with acrylic paint, china markers, pastels, patterned paper, and old-book clippings." Wow, that is a happy, good feeling book! It definitely put a smile on my face! As Omu reads a book, she lets the thick, red stew that she just made for her dinner simmer on the stove. Soon, she gets a knock on the door and it’s a visitor who has smelled her delicious stew from down the hallway. Omu offers the small boy some of her stew which he eats (picture shows him licking the bowl). All day long, the stew simmers on the stove, the delicious smell soaring through the air, drifting over the cit Wow, that is a happy, good feeling book! It definitely put a smile on my face! As Omu reads a book, she lets the thick, red stew that she just made for her dinner simmer on the stove. All day long, the stew simmers on the stove, the delicious smell soaring through the air, drifting over the city. Omu has quite a few grateful visitors during the day. It’s dinnertime and when she takes the lid off the pot, Omu is in for a surprise. I liked the facial expressions and the vocabulary that was used in this children’s book. The illustrations themselves, were very colorful and festive but the expressions did an excellent job conveying their feelings. Using everyday words with complex words, I liked the book’s language. The characters showed great etiquette to each other. A great book to share. First sentence: On the corner of First Street and Long Street, on the very top floor, Omu was cooking a thick red stew in a big fat pot for a nice evening meal. She seasoned and stirred it and took a small taste. Premise/plot: Omu is making a thick, red stew. It smells AMAZING. The smell is so amazing that it brings people--one at a time--to her home. Omu begins to share her meal. Will she have enough for herself? My thoughts: I really loved this one. Omu is such a sweet, generous soul. And as she First sentence: On the corner of First Street and Long Street, on the very top floor, Omu was cooking a thick red stew in a big fat pot for a nice evening meal. She seasoned and stirred it and took a small taste. My thoughts: I really loved this one. Omu is such a sweet, generous soul. And as she opens her home and her heart to others, they are blessed indeed. This one has the best possible ending all things considered: though she may run out of her amazing stew, the community returns with their own gifts to thank her. Thank You, Omu! is a Caldecott Honor book for 2019. I had this book in the car and my 6th grade Grand picked it up, attracted like I was, by the colorful cover...she read it silently, and then we talked...we both saw echoes of STONE SOUP, that old folk story of a community with next-to-nothing, coming together to share...but this Omu (Queen, as I learned) first shares with all who are brought to her apartment, following the smell of her red stew...until she discovers that she has given others all of her delicious stew. But never fear...Omu is par I had this book in the car and my 6th grade Grand picked it up, attracted like I was, by the colorful cover...she read it silently, and then we talked...we both saw echoes of STONE SOUP, that old folk story of a community with next-to-nothing, coming together to share...but this Omu (Queen, as I learned) first shares with all who are brought to her apartment, following the smell of her red stew...until she discovers that she has given others all of her delicious stew. But never fear...Omu is part of a real community. Omu is cooking a delicious, thick, red stew for her dinner. But when neighbors come knocking, she gives away one bowl... then another... until her dinner is all gone! But there is a surprise waiting for Omu as the neighbors come back. Dinner is saved, and everyone is grateful for their gifts. A 2019 Caldecott Honor book. Loved this beautiful picture book about sharing food with neighbors. All that I aspire to lies in these pages. :) So happy it won some ALA awards this week! An awesome picture book about sharing. Love the urban vibes here. Collage illustrations and poetic text show exactly why this book about sharing won a Caldecott honor. I love this story. The message of kindness and generosity is timeless. I've been reading all the 2018 picture books I can, including nominations for best picture book here on Goodreads. Thank You, Omu! was not nominated, but it's my favorite of all I've read so far. I thought it worthy of taking a moment to mention. Debut author Oge Mora is also the illustrator, I love her collage art. I enjoy looking closer at the layers that make the pictures, and it reminds me of a project I did with my youngest when he was in 3rd grade. It's not too long an I've been reading all the 2018 picture books I can, including nominations for best picture book here on Goodreads. Thank You, Omu! was not nominated, but it's my favorite of all I've read so far. I thought it worthy of taking a moment to mention. It's not too long and not too short, the text is "just right" for a read aloud picture book. It begins with a note to the reader: "Omu" (pronounced AH-moo) is the Igbo term for "queen." There is something awkward and humbling about not knowing how to pronounce the words when reading a children's book aloud! ☺ I love the opening note to the reader. The sense of community and neighborhood. There's a "who are the people in your neighborhood" feel to it. Maybe my heart strings were tweaked a little extra because it's Thanksgiving tomorrow. But this is sweet, simple story of giving and gratitude. Omu (AH-moo, Igbo for queen, or sometimes grandma, see Author's Note for more information) has made a thick red stew for her evening meal. Omu's stew is so good that the smell wafts over the neighborhood. Just as she sits down to read a book before supper, there is a knock on her door, a little boy asking what smells so delicious. Omu gives him a bowl full of stew and he goes on his way. All through the afternoon, neighborhood people knock on Omu's door asking what smells so good, and each is gi Omu (AH-moo, Igbo for queen, or sometimes grandma, see Author's Note for more information) has made a thick red stew for her evening meal. Omu's stew is so good that the smell wafts over the neighborhood. Just as she sits down to read a book before supper, there is a knock on her door, a little boy asking what smells so delicious. Omu gives him a bowl full of stew and he goes on his way. All through the afternoon, neighborhood people knock on Omu's door asking what smells so good, and each is given a bowl of her thick red stew. But by evening, there's nothing left for Omu to eat. There is another knock on the door, and everyone she had shared her stew with has returned, each one bringing a dish to share with Omu and each other, and so they ate, danced, and celebrated, as a way of saying Thank You, Omu. If you were to walk through a specific neighborhood, in a specific city you might meet a very special woman. Thank You, Omu! (Little, Brown And Company, October 2, 2018) written and illustrated by debut author illustrator Oge Mora is the story of this woman. Like the aroma of the stew she is cooking her generosity wafts among her neighbors. Hoo boy, do I love this book. I love cut paper illustrations, and these are top-notch gorgeous ones. I love picture books starring elderly people, like Omu. I love a good debut. I love Maira Kalman style 'people in the neighborhood' books. I love for kids to learn about sharing and giving back as a community. I love how the author didn't provide a recipe for Omu's stew, and instead left it abstract and thus, universal. Shoot. What a home run. LOVE IT. Trivia About Thank You, Omu!